In Colombia, the Agency for Reincorporation and Normalization (ARN) is coordinating the plan for the socioeconomic reintegration of ex-members of illegal armed groups. This plan has accompanied the disarmament, demobilization and reintegration of approximately 59,000 people, of whom 87% are men, 70% are young adults between 26 and 40 years old, and 72% didn’t complete high school (ARN, 2017). Holman Medina is one of those men, he comes from Huila and is 50 years old. For several years he was a member of the FARC-EP. His strong desire to live peacefully with his family and create a household led him to abandon this group. Today, more than a decade later and after an arduous fight to achieve the trust of the community, Holman is the current municipal link for the victims of Campoalegre. He is also one of 57,000 Colombians trained in financial education this year through our LISTA Initiative. 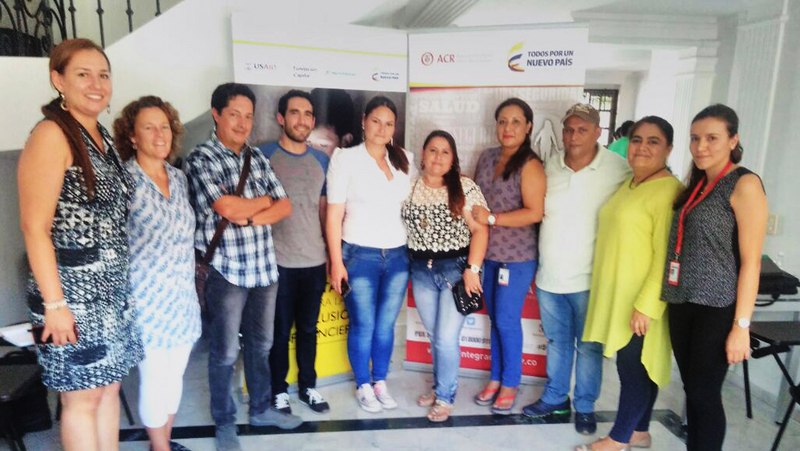 Between May and July of 2017, Fundación Capital, in alliance with the ARN, trained 150 ex-members in 5 municipalities of Huila: Campoalegre, Garzón. Tello, Baraya and Neiva. LISTA is a financial education strategy based on a self-learning mobile app and specifically designed for adults with low levels of education. It has been implemented in Colombia since 2012 thanks to the government of Colombia, through an alliance with the Department of Prosperidad Social. Between 2017 and 2018, Fundación Capital will escalate the initiative with the project “Scaling up Digital Solutions to Financial Inclusion” financed by USAID. The goal is to reach 300,000 people, training them in financial education. This is how LISTA offers an opportunity to teach those who, in returning to civilian life, confront a new financial reality. Financial education, with a focus on savings, debt and responsible consumption contributes to generating a conscious use of money and promotes planning and achievement of personal goals. It also aims to reduce vulnerability in the case of emergencies and unexpected events. This education will also help former members of the FARC to make a better use of the resources provided by the government in the framework of the Benefit for Economic Insertion. Nowadays, the mandate and challenge of the ARN, based on lessons and good practices extracted from the plan of economic reintegration of ex members of the FARC-EP, in accordance with the guidelines derived from the National Counsel of Reincorporation and in the framework of the peace agreement, is to manage, implement, coordinate and evaluate in alignment with competent stakeholders, politics, plans, programs and reincorporation and normalization projects. This effort, together with LISTA, will give support to thousands of ex-members of the FARC-EP in their process of reincorporation and normalization. Most of them are living in situations of social and economic exclusion, and with these kind of initiatives they can find education and tools for financial inclusion, that provide them with motivation to rebuild their lives.